This week Sean Hannity again promoted claims the Bush tax cuts for the rich create jobs and increase revenue. While clamor grows for the renewal of tax cuts for 98% of Americans, House Republicans again fail to justify sweetheart cuts for their sugar daddies. This no-brainer is at present still held political hostage in service of a few billionaire astroturfers. 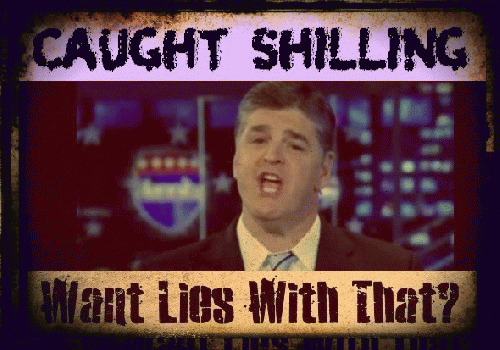 For those still unsure, Hannity's myths have been explored and debunked by many, including the non-partisan Congressional Research Service, Forbes and Washington Post and Brookings and found "false" by PolitiFact. Republican "job creationists" Lindsay Graham and Chuck Grassley explicitly told Hannity this week that expiration of the upper-end cuts would hurt employment, but the crown jewel was Hannity reciting Thomas Sowell, considered one of the Conservative movement's most brilliant. Sowell's piece doesn't hold up to the simplest check, perhaps why Sowell didn't link to his own source, a NY Times page he cites briefly, way out of context, for a brazen bait-and-switch. Hannity happily parroted it on the air to millions, without giving the "public interest" a rebuttal. "...(1) tax revenues went up - not down - after tax rates were cut during the Bush administration, and (2) the budget deficit declined, year after year, after the cut in tax rates that have been blamed by Obama for increasing the deficit. Indeed, the New York Times reported in 2006: 'An unexpectedly steep rise in tax revenues from corporations and the wealthy is driving down the projected budget deficit this year.'" "Tax revenues are climbing twice as fast as the administration predicted in February, so fast that the budget deficit could actually decline this year. The main reason is a big spike in corporate tax receipts, which have nearly tripled since 2003, as well as what appears to be a big increase in individual taxes on stock market profits and executive bonuses." Hannity and Sowell are also odiously trying to paper over how tax breaks for the wealthy increased tax revenue - it was simply because the top tier hauled in gobs of money. But this was while markets were highly volatile, poised to crater by October 2008. What else did Sowell ignore from this particular article? Revenue was higher under Clinton in 2000, so the Bush tax cuts were less stimulative, failing to meet their own revenue projections. The plus side of the ledger was money just "trickling down" at Romneyesque rates, a net negative for the overall economy. Want more? How about debt: the government was at the time borrowing trillions against Social Security surpluses. The deficit then had grown to $8.3 trillion from $5.6 trillion since Bush came in. An inverse of today, Republicans then were also fighting Democrats to raise the debt ceiling approaching $10 trillion. Spending? Through the roof, double the rate of growth, at 20% of GDP. Pork projects were rampant from coast to coast and employment was miserable as jobs sailed off to Asia. The rich were not creating jobs appreciably, and so revenue came from "tripled" corporate profits made fat by downsizing, privatizing, franchising and government subsidizing. Unpredictable stock market gains and dips made federal, state and local budgets fluctuate wildly. NYC and NY state had to hire and fire cops, teachers, firemen and hospital staff schizophrenically every fiscal year depending on the annual Wall Street bonus haul - until the crash made it all very predictable. War in Iraq was burning through billions every month, but this stayed out of Bush's budget numbers by putting it on the credit card. Just as the boomer generation started to make their first Medicare claims, Republicans made the governments' massive bulk prescription drug purchases all "high retail" by law, accelerating Medicare and Medicaid's cost increases by increasing profits for big Pharma. In all, it was the worst criticism I've ever seen on the Bush tax cuts, written at the height of it's falsely trumpeted success, yet Hannity still said the program was doing swimmingly well. Unlike Sowell though, Hannity noted it didn't last. Sowell ends his article on a high note, before the calamity. Sean said the reason revenues dropped was because of the mortgage crisis. Hannity has for years pinned the mortgage crisis (and by extension the entire global economic meltdown) on minority homeowners borrowing under the CRA. This is false too, but keeps things neat. Even if we swallowed the claptrap that tax cuts for the wealthy provide some worthwhile benefit, overlooking backdoor "corporate welfare", deductions, loopholes, pork, offshoring, skimming, abatements and socializing of employee healthcare, it would still show that this tax regimen left us vulnerable during the housing bust. This is a red flag because we're currently facing looming credit card and student debt crises today. Ironically, extending federal unemployment benefits would create five times more jobs than the Bush cuts for the rich, and extending stimulus measures are projected to create ten times more jobs. 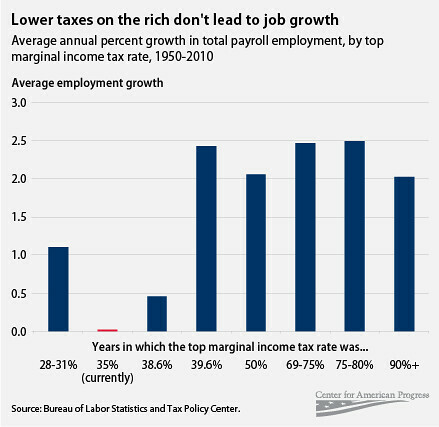 Falling short of it's own projections, the Bush tax cuts didn't spur jobs in this 11 year long experiment, it made the wealth of the already-rich soar. Even under Obama's four years, the increase at the top was 71%. Speaker Caught Again on Job Creation "Misfire"
"Raising taxes on the so-called top 2 percent -- half of those taxpayers are small business owners who pay their taxes through their personal income tax filing every year." Boehner had already been caught by WaPo doing the same thing. His spokesman had to correct his statements, saying the Speaker meant to say "half of small business income". But then, Boehner said it again - and his spokesman corrected him again, this time earning three Pinocchios. Even after this, Congressional reps appeared on Hannity to echo similar bogus claims and Boehner is saying the same thing on his Facebook page again. In WaPo's fact check, we find the number of "small businesses" who benefited from the top-end cuts to be more like 3%, just as was reported back in September 2011. The GOP not only changes their definition of "small business" depending on the sentence, but the small business community themselves affirm continually that tax rates do not determine their hiring decisions. These are instead based on demand for goods and services. Though it sounds ballsy, Hannity is relying on grammatical trickery to back his claim. He isn't technically "lying" to say the Bush cuts for the wealthy create jobs, but technically this means two or more jobs. Beyond that, cowardly Hannity and his telephone screeners need to ensure his callers never get the chance to ask him on the air - "how many jobs, Sean?" What did work fiscally? Eisenhower's punishing marginal tax rates of 91%. This is what made the rich go running to open factories, restaurants and business ventures of almost every size and description. These were staunch Conservative ideas - in 1954, Republicans were even telling voters to support unions, to fight for job security and better working conditions. Reagan championed lowering these rates, despite his own VP calling it "voodoo economics". But Reagan did so only at the end of his last term, meaning his growth rates were mostly based on top marginal rates around 50%. Are people figuring this out? Hannity might be losing his hypnotic grip on some TV viewers, flocking instead to watch Rachel Maddow. Those age 52 and lower pretty consistently have seemed to switch off Hannity since his election predictions were proven deliberately deceitful and he flip flopped on immigration a day later.